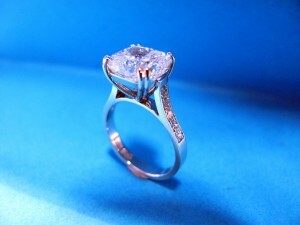 At Egoli Place of Gold, we don’t just make beautiful rings, we make heirlooms. We specialise in creating diamond ring designs that carry the emotional bond between the giver and the wearer down the years, and from generation to generation. Choosing a unique engagement ring design has always been hard. You have to find a design that suits you not only now, but for many years to come. At Egoli Place of Gold we put the skills of the traditional jewellery-maker’s craft at your disposal. 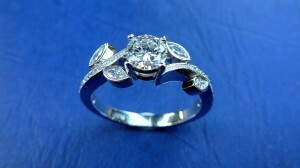 With our help, you’ll design your own unique engagement, eternity or dress ring. Our three goldsmiths combine decades of experience in helping our customers create engagement ring designs that will give enduring pleasure to giver and wearer alike. When you commission a piece of jewellery from Egoli, you are involved in the creative process from start to finish. If you already have cut stones that you want to incorporate into an eternity or engagement ring, they can be incorporated into the design. If you don’t yet have stones, our gemmologist Nicki will help you choose a stone that fits not only the ring you have designed, but your budget. Using traditional ring design methods, we will guide you through the creative process, designing the ring with you in-store, and then handmaking your new engagement ring on the premises. All Egoli jewellers work in the shop, so the risks of transit are eliminated and, you can see your ring taking shape before your eyes.